Let’s face it. 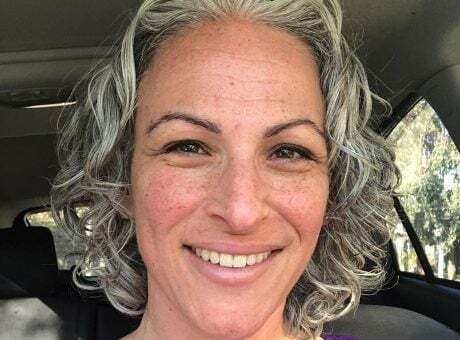 Even if you are going gray cold turkey, like I am, it can be a confusing process. Your hair is changing, and it’s not the hair you’ve known all these years. 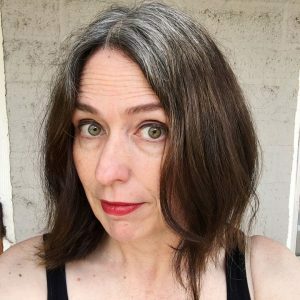 I dyed my hair for YEARS and YEARS (not sure how many, but my best guess is 25 years)… and I’m no scientist, but I think my hair got used to being dyed. Besides coloring my hair, the dye also made it smooth and shiny…for a little while. The shininess and smoothness usually only lasted a week or two, which is right around the time that my roots would start showing. So, I was paying a lot of money to have hair that only looked great for a week or two every month! Now I have to figure out how to make my hair look nice every day without pouring loads of toxic chemicals on my head. As most dyed brunettes know, once you stop dyeing your hair a dark color, the dye fades and becomes brassy. In a brunette, brassiness means unwanted red or copper tones. Here’s a picture of me from early July 2018. The silvers look nice but the faded dye is turning ORANGE. Rocking some orange hair here! 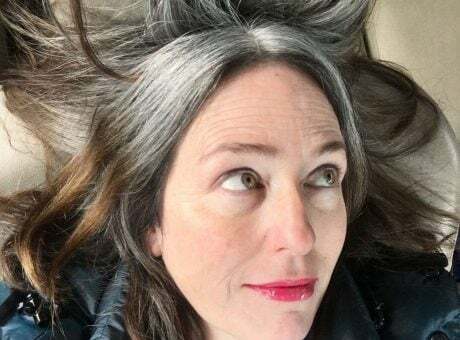 I checked in with my gray hair Facebook support groups to get some advice on how to handle this issue. 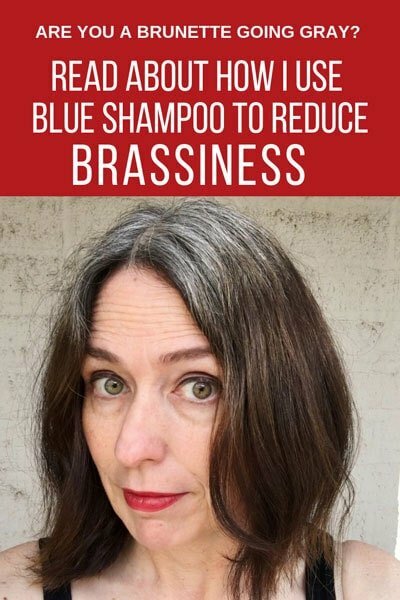 A lot of women recommended purple shampoos, but I did a little digging and found out that, for brunettes blue shampoo is best. Blondes, particularly those of the unnatural variety, have long been using purple shampoo as an in-shower secret weapon to keep their color looking fresh. The cool tones in purple cancel out any unwanted warmth and keep bleached hair looking freshly dyed. Brunettes, meanwhile, have had no such magic solution to stop their colored hair from turning brassy… until now. 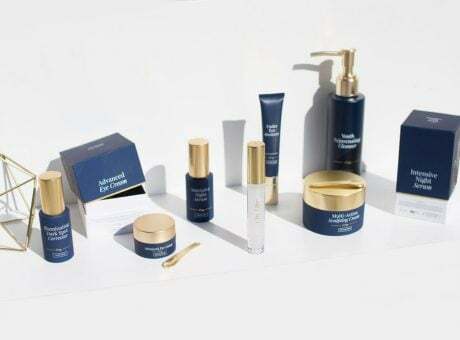 Blue toning shampoos are the latest beauty product being championed by and for brunettes, and it’s going to be a game-changer for the lasting power of your color. The same way purple shampoo is used to neutralize yellow tones, blue works by following the theory of complementary colors. It promises to banish red and orange tones, leaving dark hair cooler and with more depth — and shinier, too. So, purple is best for hair that has been dyed blonde, as purple is the opposite color on the color wheel from bright yellow. And blue is best for brown hair because it is the opposite color from orange (so it removes the orange tones). Here’s a color wheel, let’s check it out! Here’s an article from Today that further explains the blue shampoo / purple shampoo phenomenon. One of my fellow brunette Instagrammers recommended Joico Blue Shampoo to me, so I decided to give it a shot. As per her advice, I put it on dry hair and let it sit for 5 minutes. I then took a shower and added a little more blue shampoo and worked it in well before rinsing it out and conditioning. When I dried my hair, the brassiness was pretty much gone! My dyed hair looked darker and my silvers were brighter! After using the Joico Blue Shampoo on dry hair- no more orange! One note: You should only use the shampoo once a week because you can get a blue tinge to your gray hair if you use it too often. Blue shampoo can leave your hair a bit dry. My friendly neighborhood beauty supply shop recommended Joico K-Pak Intense Hydrator Treatment. I love it! After using the blue shampoo, rinse it out and put the K-Pak on wet hair and let it sit for anywhere from 5-30 minutes before rinsing out. Your hair will feel SO hydrated! I use it every time I use the blue shampoo now. My hair felt quite frizzy afterward, and even the Joico K-Pak wasn’t enough to get it back to normal. 2nd Important Note: I was tired one morning and didn’t feel like putting the blue shampoo on my dry hair. So I skipped that step and just put it on wet hair in the shower. It didn’t work. Results after putting blue shampoo on wet hair instead of dry hair. Not good. Moral of the story? Laziness always results in brassiness. Anyway, if you’re a brunette like me, you may want to give the blue shampoo a try. I’m very happy with it. I have nothing against the color orange, but I don’t really want orange hair, you know what I mean? 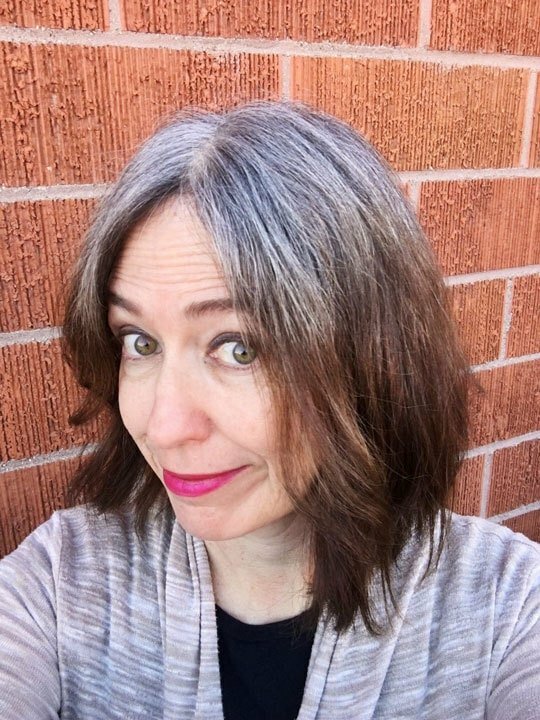 So, ladies, remember: purple shampoo for blondes (or fully silver), and blue shampoo for brunettes. I’m not sure what helps with redheads, yet – do you know? Let me know in the comments if you do! 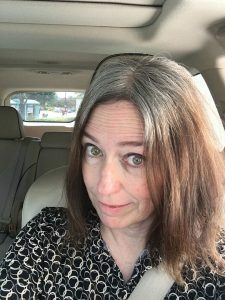 I’ve been scouring the net on and off since 2017, looking for advice and materials to going grey. Your site is a God-send. I last dyed my hair in Dec-2018. This tip on the blue shampoo will come in very handy. 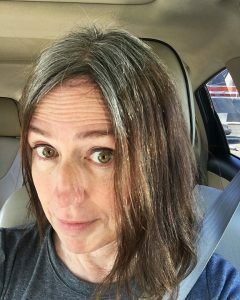 Katie, I am 8 months into my silver transition. My “real” color is brown. Thank you for your info – I’ve been using purple shampoo and will now try the blue. I have long hair and can’t wait until this transition is over! Hi, Barbara! I’m so happy that this article helped! The orangey tones didn’t bother me much at first and now they are really starting to get to me. But like you, I like long hair so don’t want to cut it all off. Good luck with the rest of your transition! Thank you, Jackie – your feedback means a lot! I’m happy to host a more private space for us ladies in transition. It’s such a fraught thing still to go gray in our culture – we need all the support we can get! I think my transition will be similar to yours. 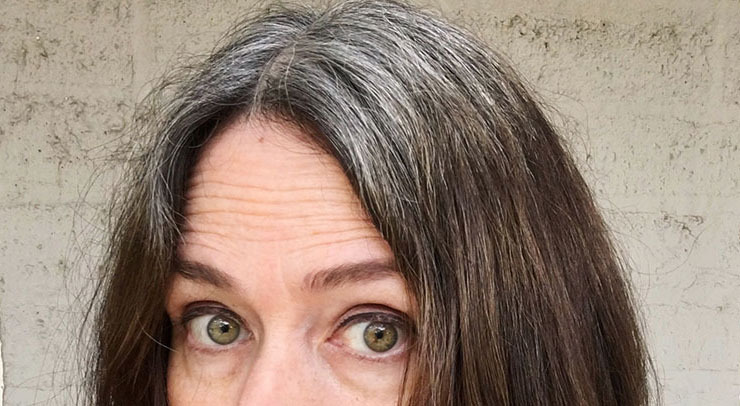 I am also a brunette and my hair does turn orange as the grey starts to grow out. I always chickened out when that happened and went back to dying. However this time I am committed ever since I saw yours. Thanks for the help on the best products to use on my hair as I transition. I am 68 and should have done this years ago. I am starting my 5th week into this so I have a long way to go. Keep posting as it helps all of us newbies! Thanks, Grace – I’m so happy you are finding help here! That’s why I started this blog – because I was confused about the process and what products to use, etc. I’ll definitely keep posting – I’m in this for the long haul! I personally use Schwartzkopf BonaCure Excellium range. It is creamy purple and enriched with Q10+ pearls… I love it !!!! That sounds amazing – I’ll look into it! I just ordered the Joco Blue Shampoo…I have the same problem with the brassiness…thank you for the reccomdation!! I’m so glad! I hope it works as well for you as it did for me. I wish I had known about this product years ago, as my dyed ends have always turned somewhat orange the last week or so before dyeing.